To publish your site using Freeway Pro, select File > Document Setup > Upload and enter your WebMate FTP details from your Welcome PDF. 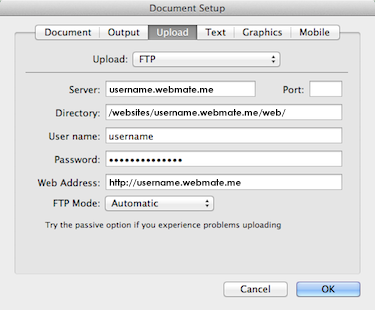 Before you can publish your site using Freeway Pro you will need to enter the FTP publishing settings that were sent in your WebMate welcome email. From here enter your FTP server details exactly as they appear in the WebMate Welcome email you received at signup.